Maier-Saupe theory is the canonical mean field description of thermotropic nematic liquid crystals. 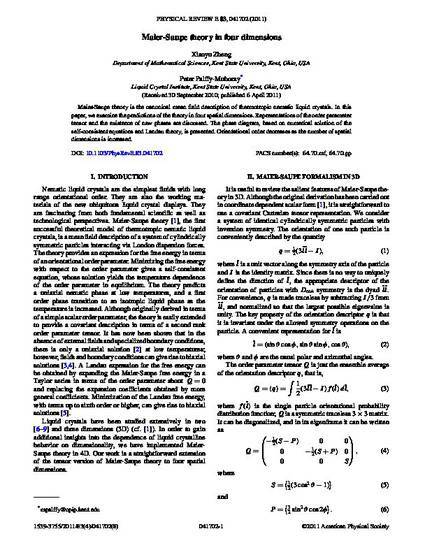 In this paper, we examine the predictions of the theory in four spatial dimensions. Representations of the order parameter tensor and the existence of new phases are discussed. The phase diagram, based on numerical solution of the self-consistent equations and Landau theory, is presented. Orientational order decreases as the number of spatial dimensions is increased. Copyright 2011 American Physical Society. Available on publisher's site at http://dx.doi.org/10.1103/PhysRevE.83.041702.